Fiction – paperback; Penguin; 336 pages; 2004. 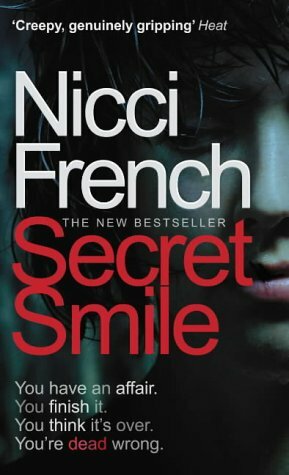 Secret Smile is the sixth novel by the husband-and-wife-team who write under the pseudonym Nicci French. In many ways French is a one-trick pony: each book tells the same story — a woman on the run from a menacing force while her family and friends ignore her pleas for help — only the details change. But French has the knack of ensuring each story sounds fresh and new, and, more importantly, scary as hell. Secret Smile is no different. In this creepy tale painter/decorator Miranda Cotton breaks up with her “almost” boyfriend, Brendan, after she finds him reading her personal diaries without asking. Just two weeks later Brendan becomes engaged to Miranda’s sister, Kerry, after a shock whirlwind romance. This deeply unsettles Miranda, but family and friends misinterpret her disapproval as jealousy, something that Brendan capitalises on by telling people that he dumped Miranda, not the other way around. Slowly Brendan ingratiates himself more and more into the Cotton family, going out of his way to drive a wedge between Miranda and Kerry. When his behaviour turns threatening, Miranda finds it difficult to make anyone believe her side of the story. And as things progress from bad to worse, it’s not only Miranda who finds her life put at risk. This is a definite over-the-top story. But it’s a great chilling psychological romp. And sometimes it’s nice to let a book take you on an exciting journey without having to take anything too seriously. A good read if you’re looking for something entertaining and just a little bit creepy. I know this review is going back a bit, but I wondered if you could tell me your favourite French. I have only just discovered them and started on Killing Me Softly..
Kate, definitely The Memory Game. In fact, the earlier stuff is better than the later stuff. Thank you. I very much appreciate it and I am going to get that one out. How does the one I am reading fare?